“An idea is like a seed” I babbled the night before in front of the team whilst in the pub who had offered to let five of us stay there for the night for free, “If you feed it then it may grow beyond all your imagination.” I had a pint of Black Sheep to aid me in my oratory. “And this is what I mean, this was once just a simple idea and now we are all sat here ready to make a giant sand drawing tomorrow.” This was all received well and after the meeting we retired to the comfort of a cosy corner and a few more rounds of fine ale to encourage our Bravado. “You must be joking.” These were the dishevelled comments of the great and most talented Mark Yates as I woke him at 6am the next morning. The benefits of beer from the night before had turned on us. But there was a golden moment waiting. Finn’s mom had promised an English Breakfast to start our day at her house, and even though she is a vegetarian, she took great delight in stuffing our bellies with pork, hasbrowns, toast, beans, and even a bowl of cornflakes if you could fit it in; which I did. But we indeed had a lot to do and needed some whole hearted fuel to do it. Unfortunately, Finn who was filming the piece could not join us as we tucked into our succulent bacon, as he had been on the beech since 4am filming the sunrise shot in time lapse. We hauled our full bellies into the car and made our journey from Malton to Filey, winding through the sleepy villages of Yorkshire on this glorious Mothers Day, the sun glistening over the hills, with trees on the verge of coming into bud and leaping forward in the fullness of spring. As it was a Sunday, we listened to the ‘Faith hour’ on radio York, apparently a lady had made a successful exorcism of a woman and child that had been plaguing a young family, and had managed to lock them in a jar of holy water. Well done to that girl. By 8am the team of 15 had arrived. Of course things did not go completely to plan as is always the case. We had some ‘technical issues’ with the camera and then I had to do the introduction which is timed to music, it took a few rushed shots and I unfortunately marked 10 out of 10 for ponce value; I think we’ll have to do some editing there, but for now, we’ll all have to endure it. After that we had to lay out the graph on the sand which is always demoralising as it seemingly makes no sense to anyone but me and people just have to go with my commands down the walkie talkies. “Roger that, that’s right, lay the wooden spoons in every 10 meters. Over.” This is always a great workout for me as I’m constantly sprinting the vast area of the drawing which is 75 meters to make sure things are in place. “Isn’t it getting a bit late Jamie, what’s our schedule like?” It was indeed a little late and there was not room for much error, and our error at that point was about 45 minutes. The drawing phase seemed to go well and is always a relief as it instils a sudden confidence that the project may actually work. But then there was still the time issue highlighted by my dear friend John’s ever so slightly sarcastic relish of “They are behind time.” But behind we were, and now by at least an hour. The tide had already turned over an hour ago and we had a two hour drawing to rake. It did not seem possible now to do it within the time frame. I discussed this with Finn and he suggested that we stay with the original calculations as to change it now could ruin the piece. “OK chaps, have a sandwich and a quick break and then we’ll get the raking started. Visit the toilet if you need it as there will be no breaks once we begin the drawing.” Like a flock of birds everyone dispersed and I was left with my Tuna sandwich pondering the time issue, and then suddenly an idea dawned on me. Of course, five minutes is always ten and it was a while before everyone returned. Edward had gone for a walk to search for Filey’s best sandwich but on we went. I gathered the team again and explained how we were to rake in beat with a drum that would synchronise with the camera taking a photo every ten seconds, together with the alterations that we had made. “But I’ve only just got my head around the other method!” piped Hannah. Each team was then going to begin drawing at the sound of the fog horn which I love. I’m thinking of attaching it to my bicycle. After many final ramifications and reassurances that everyone knew the plan, I fired the fog horn, “BOOOOM!” This was then followed by the almost silent click of the camera as it took the first frame of the sequence. The raking had begun and now there was no turning back. The raking was an intense process, watched on by all that had come to walk on the promenade in Filey that day. 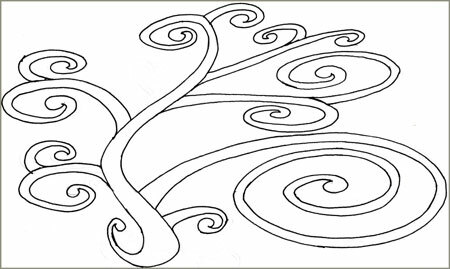 Suddenly an unthinkable image had started to appear in the sand, it was no longer an abstract idea, it was growing like a plant, the central trunk advancing down the beach with limbs branching and spiralling from it. People on the beach passed by with no idea what they were walking over, it is impossible to know what these crazy folk with rakes are up to unless you can see them from above. The serenity was only partially quelled as I intermittently fired to foghorn to signal the start of a new limb. “The sea’s getting pretty close!” advised Andy Moss. The beach was not so steep and I knew that one wave could charge in and take the not yet finished top of the drawing. “Mr Yates, I called on the walkie talkie. Double the rake speed if you would!” And so with a final charge the image was finished before the unrelenting sea managed to take it. There is no allowance for mistakes when you are playing by the rules of the cosmos, moons and suns do not wait for sand drawings. But of course, as you can see from the film, all went well. The seed did indeed flower into something beyond our imagination. And that was the thing really, originally it was just an idea, but with thought and application it became a living thing, and not just a piece of animation. 15 people, some of which who had never met, travelled over counties, stayed in each others homes, were never kept wanting over food and good cheer because of unreal hospitality, and finally got to share a day together of our short lives that none of us will ever forget. 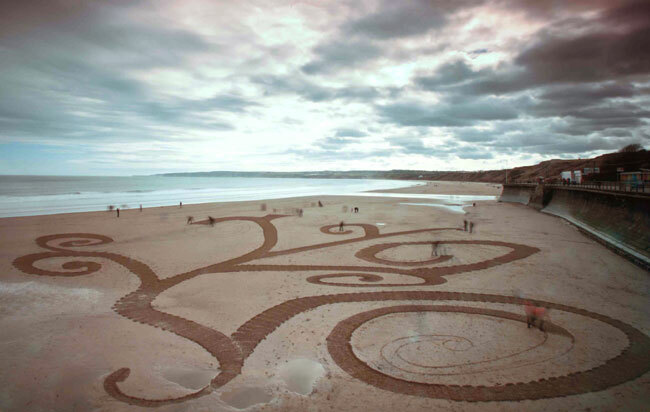 “Do you remember that sand drawing on Filey beach……” we will say. Thank you to all those involved, and cheerio for now. wonderful work, and I love the combination of the growing tree with the movement of the clouds overhead.. and getting the sense of the looming tide.. the reflections from the beach are great too. I want to get to the sea and do one over here..
will lift a pint of the local ale to all of you tonight.. It was indeed a grand day out, tricky racing against the tides, especially as we were making a film as well as a drawing. Film is working really well on these projects, with the sand sculpture also. We’re working on one now from a sculpture we made this summer which should be great. So yes, get on the beach and start raking! Well done for your lovely art work on our lovely beach. I wish I had seen it live, as well as in animation.Hope you have more intersting ideas. Thank you very much Jacqueline. If you go to the website then there is a face book group link where we can keep you up to date on any events taking place. Cheerio! Thank you very much Jacqueline. If you go to the website then there is a face book group link where we can keep you up to date on any events taking place. Was this a week ago now? Seems like yesterday! Ranks highly on my Mothers’ day experiences to date. All of us from Finn’s Aberration crew really enjoyed the specialness of the day and the feedback from this end, (Malton, North Yorkshire, and Stockwood, Bristol) has been fantastic! Even ‘The Munsen’, my 16 year old grandson, had a great day and as you’ll remember, it takes a lot to get a 16 year old out of his pit, particualrly on a Sunday morning following a ‘hefty’ night before. Needless to say, it’s great to see Finn develop his craft, but as a Mum, it’s also wonderful to know he is working with very talented and imaginitive people. Don’t know if you keep a database of interested folk, but several here, me included, would be happy to join in in any role. I do a particularly fine turn as general skivvy…..I’ll have to keep working on the bacon cooking abilities tho’! Loved the day, love the film. Well done y’all.